Got a belly you’re not happy about? Reduce subcutaneous fat in the abdominal region with this easy DIY massage blend consisting of grapefruit, sweet orange, sage, cypress, and juniper berry essential oils added to a carrier oil, such as sunflower seed oil. Studies show it works! Did you know that you can massage away your belly fat? Seriously. It’s true! Two scientific studies out of Korea showed that it’s possible when doing self-massage with certain aromatherapy essential oils for an extended period of time. So, when I found out about them, I knew I just had to share them with you! A 2007 study demonstrated that post-menopausal women who used a combination of five essential oils, including grapefruit and cypress, to self-massage their abdomen twice daily for six weeks had a significant reduction in subcutaneous fat, reduced their waist size, and even improved their body image. And a previous scientific study done in 2000 showed that aromatherapy massage not only reduced fat and waist size, but even helped reduce appetite in middle-aged women. Wow! Sounds great, huh? Considering abdominal weight gain is a problem area for many women, including yours truly, I was also convinced I had to try it. Now, I was already very well acquainted with the many therapeutic benefits of aromatherapy and massage therapy due to my holistic health training, but I honestly never tried to use them together to target just one specific part of the body—namely, the belly. So, these studies prompted me to come up with my own recipe for an aromatherapy massage oil to reduce abdominal fat and to give it a go. It’s a happy, uplifting blend that would be equally pleasing to both men and women. Read on for all the details, including how to make your own massage blend, when to use it, how to use it, why it works, the kind of essential oils you should use, options, and more. I think you’ll be convinced to try it, too! This recipe makes 1 oz. of massage oil. Essential oils can be found in the personal care section of most natural grocery stores or on-line from sources such as Amazon. Pour the almond oil into a massage bottle and then add in your essential oil drops. Shake well before each use. Store out of direct heat and sunlight, which degrade the essential oils. Also, the above measurements are based on the assumption that there are about 600 drops of essential oil per ounce in a bottle with a euro-dropper. However, the size of drops can vary, especially if you’re using something such as a plastic pipette. So, when in doubt, measure using milliliters instead of drops to be accurate. Aim for 1 ml. (.9 ml to be exact) of essential oil per 30 ml. of massage oil to get a 3% concentration. In place of almond oil, you may use other oils, such as sunflower, olive, fractionated coconut oil, or cold-pressed grape seed oil. However, I wouldn’t use canola or vegetable oil. Don’t have all the essential oils on hand? No problem. Feel free to substitute them with some of these: carrot seed, sweet fennel, ginger, juniper berry, rosemary, sage, lemon, sweet-orange, cold-pressed lime, and tangerine. Using this aromatherapy massage oil for stomach weight gain and cellulite is pretty obvious, but it would also be helpful for water retention. It may also be useful if you’re going through hormone fluctuations, such as those experienced during peri-menopause and menopause, and beginning to notice differences in how your body distributes weight. Even if you’re not going through “changes in life,” sometimes xenoestrogens (synthetic or natural chemical compounds that mimic estrogen in your body), build up in the body, affect your metabolism, and cause weight gain. And this is true for both men and women. So, this massage oil could be used by men, too, even though the research has focused on women. Even though the researchers used an aromatherapy massage blend to just target subcutaneous fat on the abdomen, I would think that massaging other common problem areas would be helpful as well. So, maybe give it a try if you have other spots you want to work on. Also, use it twice a day for at least six weeks as that is the time period that was proven effective in the 2007 Korean study discussed in the “Why the Essential Oils Work” section below. By the way, before using it, warm the oil slightly by placing the massage oil bottle in a cup of hot water if it’s cold. Otherwise, you will shock your body and be stressed — the opposite of what you want to achieve! And when massaging your abdomen, move in a clock-wise motion. In addition, to be really effective, I’d probably incorporate this belly-busting massage into a daily holistic health routine to support weight loss, which I will go into in detail in a later post. But for now here are a few quick tips: First thing in the morning I’d drink a glass of lemon water and continue to drink plenty of water throughout the day, such as cucumber spa water, to support detoxification and reduce water retention. Before showering, I’d do dry skin brushing, because that improves muscle tone, reduces cellulite, and more. I’d also be sure to exercise, meditate, and eat plenty of healthy foods, including a boat load of organic fruits and veggies. You may be asking yourself how essential oils can help facilitate weight loss exactly? Well, essential oils have many therapeutic actions due to the chemical constituents they contain. In the 2007 study summary, two essential oils were named specifically — grapefruit and cypress. So, lets start with those. Grapefruit is known by aromatherapists to be beneficial for cellulite, weight gain, and water retention because it works well on the lymphatic system (i.e., our body’s “waste disposal system”) by increasing the flow of lymph, thereby facilitating the removal of water and toxins. Toxins by the way get naturally bound up in our fat tissue as our body’s way of protecting itself, so as the fat breaks down, it’s essential that something be done to support toxin removal. Cypress is a diuretic and also has an astringent and tonifying effect on tissue. In addition, because it’s known to help menstrual problems and even help some menopausal symptoms, such as hot flashes, Cypress seems to help balance hormones. Because hormone fluctuations are one suspected cause for abdominal weight gain in women, it really is a useful in this regard. In addition to cypress and grapefruit, though, there are other many well-known essential oils that are used by aromatherapists for cellulite, toxin removal, and water retention. They are carrot seed, sweet fennel, ginger, juniper berry, rosemary, sage, and some select citrus essential oils (e.g., lemon, sweet-orange, cold-pressed lime, and tangerine). So, I suspect that the scientists would have used some of these in their formula as well. In my formula, I knew I definitely wanted to use grapefruit and cypress to replicate what was used in the study as closely as possible. And because I had sweet orange and juniper berry on hand, I also chose those as I thought they would complement the grapefruit and cypress nicely and make a pleasing blend. However, after mixing them in, I realized it seemed flat and needed a little something more—a little more complexity. Sage was calling my name, so I added in some sage. It gave it a nice touch of “spice” and seemed to make the blend come together and round it out somehow. After letting the blend sit for a few minutes, the scents melded nicely and I ended up with a bright blend. By the way, as aromatherapy also affects your mood, having something pleasing as well as functional is important, too. Massage therapy is very therapeutic on many levels. In terms of weight loss, it’s beneficial in that it reduces stress, increases circulation, and improves lymphatic flow. Also, abdominal massage in particular helps improve digestion and reduce constipation. Reducing stress helps reduce cortisol levels in your body. A recent 2014 study published in Complementary Therapies in Medicine showed that after just one aromatherapy massage salivary cortisol levels were significantly reduced. High cortisol levels from stress have been associated with increased abdominal weight gain, even in otherwise slim women, as shown in this 2000 study published in the journal of Psychosomatic Medicine. So keeping cortisol levels in check seems essential to preventing abdominal weight gain. And what better way to do it than with frequent daily self-massage using essential oils to support the process? By increasing circulation and improving lymphatic flow, massage therapy helps bring vital nutrients and oxygen to cells throughout your body, and also helps eliminate toxins, carry away metabolic waste, bacteria, and more from your body, respectively. So massage really does help your body function better overall. A better functioning body is obviously more efficient at keeping water levels in check, eliminating toxins, regulating hormones, and more. All things great for a better looking—and healthier—body! Essential oils are concentrated so they should be handled with care. Don’t let essential oils come into direct contact with your skin, eyes, or mucous membranes. (There are a few exceptions, such as lavender, that are actually beneficial to put directly on your skin.) If you get essential oil on your skin, wash with soapy water and rinse well. If some gets in your eyes, immediately flush your eyes with water for several minutes. If irritation persists, seek medical attention. Some essential oils are contraindicated if you have certain medical conditions or are pregnant. For example, sage oil should not be used by pregnant women or those with epilepsy. Likewise it should not be used by children. Juniper berry oil is also contraindicated during pregnancy. On the other hand, sweet orange, cypress, are grapefruit are generally pretty safe. Please consult a qualified aromatherapist when in doubt. So what do you think? Are you tempted to give this blend a try? If you decide to make it, let me know how you like it. And this is the important part—let me know if you notice any difference using it! That is, did you notice a reduction in fat around your mid-section? I’ll also be sure to report back on how well it worked for me. Battaglia, S. The Complete Guide to Aromatherapy. (2003). 2nd ed. Brisbane, Australia: The International Centre of Holistic Aromatherapy. Keville, K. (1995). Aromatherapy For Dummies. New York: Wiley Publishing. This article was updated on April 20, 2019. Copyright © Karen Peltier and Well Gal, 2014 – 2019. All rights reserved. Photos © Karen Peltier and Well Gal, 2014- 2019. Hi, I have read most of the the reviews. Thinking that maybe cramps come from the massage and moving things inside of the digestive system that are stagnate in there? I had a similar experience when my doctor did a pelvic exam and he did poked my stomach and he asked if I was constipated. About a half hour later I had lots of cramps. But, the two above reasons are not why I came to leave you a review, LOL. Not sure it made much of a difference as far as fat goes. I have only used one bottle. The HUGE difference was a sun spot I had on my belly. OH my goodness, it totally wiped it out! I’m now making another bottle for the rest of the sun spots I have. Still going to use it on my belly because all of the oils you mentioned are very helpful for the organs and their cleansing. I did use Basil in the place of the sage oil, because I didn’t have it and plus even if I had it I wouldn’t use, because I do not care for the scent of sage. can we mix the Aromatherapy Massage Oil?? I just found this post and I am going to test it. 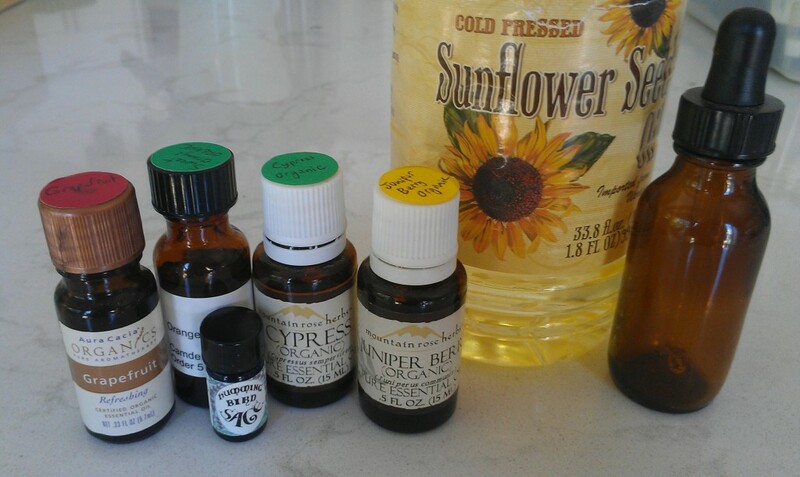 I just made this mix-by my calculations I have a 2-ounce bottle so I doubled it, plus added lemon in the same amount as the other primary oils. I used the larger amount of sage and possibly too much juniper. (Mine comes out really fast.) I just mixed it so I won’t start using it until tomorrow. As of tonight my abdominal measurement at the belly button is 39.5 inches. I will update weekly . So I added the same amount of sage as all the rest. I didn’t have the recipe in front of me. Can I use it now? Sage is rather strong, especially the scent. But it’s probably fine if you doubled it. If in doubt, apply a drop of your mixed solution to your wrist first to check for dermal sensitivity. If you have no reaction, you’re probably fine with using it for your belly-busting massage oil. Note: Don’t use sage during pregnancy or while breastfeeding. I tried this formula for 2 days but had to stop. I kept getting painful stomach cramps during the night, when I stopped using the formula, the cramps stopped. I used ginger and lemon in place of juniper and grapefruit as I haven’t ordered these yet. Want to try it with those when I get them. Could this reaction be an allergic reaction to one of the oils? Found out the problem myself since you are busy. Other sites stated to wash the formula off your belly after and hour or two. So I tried this and it worked,no more cramps. Thanks for your help. Thanks for stopping by and leaving another comment. Sorry for not getting back to you sooner and I’m so sorry you had an unfavorable reaction! But I am glad you discovered a solution that works for you! I wanted to offer some other solutions for you as well. My first suggestion would be to reduce the concentration of essential oils by one half or even more since you were sensitive to the formula at full strength (i.e., 3% concentration as noted in the recipe). If that doesn’t work, you could try to get to the bottom of things and see which essential oils you may reacting to by testing one at a time. Mix a drop or two of essential oil in a carrier oil and massage it on your abdomen. Then try another one the next day and so on. Obviously, if you have a reaction, you know to eliminate that essential oil from the recipe. Of course, essential oils do act synergistically, which is why I suggest simply reducing the concentration of the formula first. Once you find the correct concentration and essential oil blend for you, it seems to me you could leave them on for more than an hour or two to get the full benefit of the cellulite treatment before washing them off. Unfortunately, washing it off didn’t help either. Don’t know why I thought it would but I’m going to try your suggestions, thanks for leaving them. I sure don’t want to be left out of using this recipe!! I am dieting and will be studying Complementary therapies at college from next week. My college aromatherapy kit arrived today so I’m looking forward to trying this blend from this evening. Thank you for the great information. Just wondering if there is some blend already made for this…so that I don’t have to buy five different ones? Expensive… What company domyou reccomend purchasing them from? No blend is already made for this that I know of. And yes, the initial investment may be expensive (which is relative of course), but the essential oils will last you a long time and can be used for so many other things (e.g., green cleaning, bath salts, etc.). So, they’re well worth it in my opinion. Several good aromatherapy companies exist. At a minimum, always look to see if the botanical name and country of origin for the essential oil are listed on the bottle before deciding to purchase it. If they’re not listed, I recommend looking at other brands. Hi Well Gal, Thank you so much for sharing your information. I am just getting into essential oils so I’m trying to do a lot of research. What was your results using this belly busting massage oil? How long did you use it? Hi Kay. It’s been awhile since I had made the aromatherapy blend, but I remember only using it for a few weeks versus the full twice-daily, six-week period as was done in the study. So, corroborating scientific results I can’t provide at this time. 🙂 But please do let me know if you try it and how it works for you. Karen Peltier recently posted…Want to Heal Your Gut & Regain Control of Your Health? Check Out This Summit! Hi Well Gal, So pleased I come across your site. I just love it. I was wondering if you could add more oils to the above recipe, like peppermint, lemon and lavender? Thanks so much. Hi Bev. Thanks! I would think that adding lemon essential oil would be a good addition to the above aromatherapy recipe since it’s helpful in detoxing the system and also useful in treating cellulite as Savlatore Battaglia mentions in his book, The Complete Guide to Aromatherapy . Peppermint essential oil helps activate the lymphatic system and enhance lymph flow, so that would work, too. Lavender isn’t a targeted treatment for cellulite or detoxification, but it’s definitely used in countless formulas to round them out, so I’m sure a little wouldn’t hurt, but I wouldn’t make it the main focus in your formula. My daughter has an autoimmune disease that is causing an accumulation of belly fat, cellulite and bloat. We started the massage idea with Rosemary only. We’ve now made our own custom blend with some additional oils and are slowly seeing results. We spent the whole summer trying diet and exercise as our main option and we’re left with skinny everything else but a very distorted and not age appropriate belly. Hello. Can you tell me what other oils you used with the rosemary oil? In the recipe, there aren’t any “carrier oils” noted, and it is mentioned not to apply essential oils directly to the skin. This is a combination of essential oils, so does the mixture make it ok? In the ingredients for the recipe, I list almond oil (1 oz. ), which is the carrier oil. You definitely need to use some kind of oil in addition to the essential oils; otherwise, you would irritate your skin and possibly have other adverse reactions. If you don’t have almond oil, other oils, such as olive, grapeseed or sunflower oil, may be used as a great substitute. I just reread that, prior to seeing your comment, and noticed the Almond oil as being the carrier. Sorry for not catching that the first go round! I have Coconut oil (solid), is that ok? Aromatherapists often use fractionated coconut oil as a carrier. Fractionated coconut oil remains a liquid at room temperature and when applied is easily absorbed by the skin. I’ve never tried the solid coconut oil in this type of application — only in things like sugar body scrubs — but if I were to do so, I’d choose a virgin coconut oil. Let me know if you give the coconut oil a try and how it works out for you! Just wondering Well Gal…what where your results after continued use, how long did you use it for? I would like to try it for myself but always nice to get feedback. Thanks. I was just wondering how long should I massage my stomach for? Thanks for your question. The study summaries didn’t indicate for how long, but I would think that just enough to get the oil absorbed would be sufficient. Wonderful post, especially the Korean research, and very interesting where we can make the oil itself, I saved in my favorites. Do you have a link to the Korean study? I would be very interested in reading it. Thanks for the blend, I am going to start using it today! Glad you like the blend! Let me know how the blend works out for you. It’s surprising that aromatherapy materials could make a difference, don’t you think? One cannot help but wonder who first thought of this and how? Perhaps it was a massage therapist? I’d love to say I would try this, but I don’t know how to get sticky oil into my routine. It is sticky isn’t it? I am still amazed at how aromatherapy makes such a difference, but I am not surprised considering that some form of using plants as medicine has been around since ancient times. For example, the Egyptians used aromatic resins, balms, and essences for medicinal purposes, cosmetics, and even embalming. And the idea of massage with aromatic oils has been around a long time as well. It has been a part of Ayurveda, which is a 5,000 year-old system of holistic healing. However, the term aromatherapy didn’t get officially coined until 1937 when a French chemist published a book about the healing properties of essential oils. He had burned his hands in a laboratory explosion and plunged them into the first thing he could find, which was lavender essential oil. The skin on his hands healed quickly without any scarring. From that moment onwards, he studied essential oils and then others eventually followed suit. So, who knows who really thought of it first, but it was probably someone very wise several thousands of years ago! For more history on aromatherapy, check out this link on the Alliance of International Aromatherapists site: https://www.alliance-aromatherapists.org/aromatherapy/brief-history-of-aromatherapy/. Essential oils are great, especially when we know which ones are good for what. Your post is very informative and provides useful tips. Hello Yorinda. I absolutely agree that essential oils can be so helpful when we know how best to use them. I don’t think the term “belly busting” is common, but it made for good copy! This looks like a great alternative to OTC weight loss remedies, for sure, Karen. I remember a company called “It Works” that sells a belly wrap that is supposed to reduce inches after a few applications. I don’t know what is used in the wraps, but I’m wondering if it might be something like this. I’m glad you mentioned the importance of cutting the essential oils with a base (almond in this case). I often hear people talk about applying the essential oils directly without cutting them at all. This sounds like a nice recipe and regimen. Look forward to hearing your more comprehensive plan for handling this issue. Spa body wraps are definitely another way to help support weight loss/water retention, so I’m glad you brought it up! The ones I’m most familiar with have been herbal, seaweed-based, or mud/clay blends. I’m sure they probably had essential oils added to them as well. I think they can be effective as part of any overall holistic weight-loss program. And yes, using a carrier/base oil with most essential oils is important. However, there are a few exceptions, such as lavender and tea tree. However, when it doubt, mix your essential oils into a carrier oil. I’ve never heard of this but I think it’s worth the try. However, I’ve no patience for mixing… or hunting ingredients as I’m really busy. Any brands out there that have this mixture? Hello Nile. Unfortunately, I don’t know of any brands or even products on the market that have this mixture or are specifically targeted to reducing abdominal fat. It’s something I came up with by myself based on the research studies and my training in aromatherapy. Hence, the beauty of making it yourself. This recipe only takes about two minutes to make, by the way. It might take 2 minutes, but if I can spend less time making things and buy it, then I can do more. Might be a nice little idea to try an sell? Hi just a thought, I bought it all from Amazon (pretty expensive though) it was delivered to my door (super convenient) mixed it in less than two min and I have enough to last a long while. Buying it in a store may be less but you’ll spend precious time running back and forth to keep getting more.. By the way it does work. It’s worth whatever effort you do put it. It sounds wonderful Karen. Do you think it’s necessary for people to exercise as well, or do the oils eliminate the belly fat by themselves, along with the diet? The problem with just dieting, is that (depending on your age), you are often left with flabby bits from where the tummy got stretched out – so I can see how the oils could help with that problem. Hi Julieanne. Thanks for your comment. Yes, exercise is always helpful and I really believe in a well-rounded holistic approach to combating any health issue. I suggest some complementary therapies to try, such as drinking lemon water in the morning upon waking, in addition to the belly-busting aromatherapy massage oil in the article. See the section subtitled “How to Use It” for more details. Oh this sounds lovely Karen. In fact if it weren’t for “belly fat” I’d be tempted to have someone else do the massaging – but still what a self nurturing way to rid ourselves of a pesky problem. Thanks for the great tip and thorough tutorial on how and why to use it. Hi Marquita. A “pesky” problem is a good way to describe abdominal fat as it really is a hard one to combat without the right approach. I’m glad you brought up how it’s a great way to nurture ourselves, too. I think that’s an important concept. We often don’t give ourselves the attention and care we need. So doing daily self-massage is a great way to do it. As always, thanks for your comments! This is great information! I have been looking for a great blend to massage in prior to using my heat and plastic wrap. Heather recently posted…Where has the time gone? Hi Heather. I’m glad you found this aromatherapy massage oil blend recipe helpful. I think doing it in conjunction with a body wrap is an excellent idea! Let me know if you get results. This is great to duplicate the mixture. I found working with oils has helped me also, increase my awareness of making thing myself. It brings a humble feeling to me. This is also, refreshing. Now, with this oil mixture. Also, the limited exercise I can perform. I will see what a result will be in three months. I feel stomach crunches is the support most people may want to look into. Thank you for this share. It can be used for all of us. William Amis recently posted…Perspective with experience! Hi William. Doing stomach crunches in conjunction with the belly-busting aromatherapy massage oil would definitely be a great combo! Looking forward to hearing your results! Please report back and let us know how it worked out. Hello Andy. I found the Korean studies super interesting, too, especially because they were well done scientific studies showing significant results with just doing aromatherapy massage to fight abdominal fat. As always, thanks for taking the time to comment. I appreciate it.